This has been a year of significant growth in achieving FCF’s mission of research, education and patient support. RESEARCH: FCF invested over $500,000 in fellowships to scientists and physicians studying fibrolamellar. The Foundation funded innovative research that can be applied to patient treatment, and attracted multiple grant applications through a new grant application process. These research projects are in collaboration with the University of North Carolina, the American Clinical Society of Oncologists (ASCO), the Cancer Research Institute (CRI), Johns Hopkins and the International Center for Cell Therapy and Cancer Immunotherapy in Israel. We also funded previous grants to Rockefeller University and Yale. EDUCATION AND AWARENESS: FCF’s work in 2015 extended to various US Government agencies: NIH, NCI, the Congressional Childhood Cancer Caucus and the Department of Defense. The Foundation also partnered with leading rare disease organizations focused on rare gastro-intestinal cancers. In addition, FCF worked to establish connections directly with pharmaceutical companies. 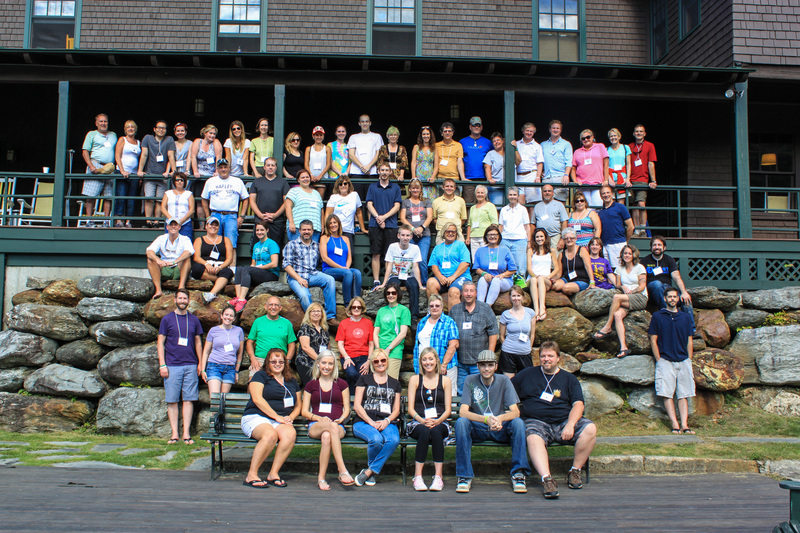 PATIENT SUPPORT: For the fourth year in a row, the very important patient and family gathering was held in Vermont. Guests arrive from all over the country to bond, share and find a community who understands. This was also a year of strengthening and expanding FCF’s internal structure, as prescribed in the Foundation’s strategic plan. FCF hired a full time executive director, expanded the Board of Directors, and established a formal research grant review committee. FCF thanks all those who donated to the Foundation to make these many achievements possible. Additionally, FCF is grateful to Stone Point Capital for providing administrative support and guidance to Foundation; and to the Charles A. and Marna Davis Foundation for covering all other administrative expenses of FCF so monies raised go directly to research. 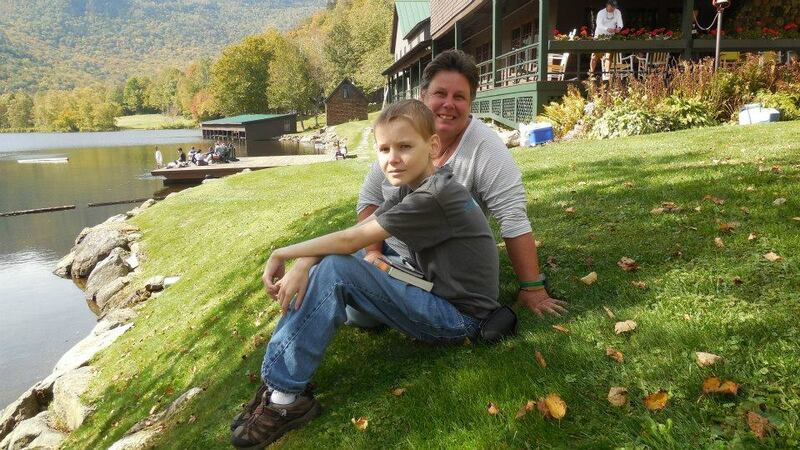 Wonderful weekend at the Trout Club in Stowe, VT for 60+ patients, families and FCF volunteers. See stories and photos from the weekend here! FCF is pleased to announce the hiring of a new Executive Director, John Hopper. John is FCF’s first full- time employee, totally dedicated to the mission of FCF. FCF has grown considerably in the five years since its founding, with a predominantly part-time and volunteer staff. It is time for a business person, such as John, to drive FCF to its next chapter. John will be managing the day-to-day operations of the Foundation, coordinating research initiatives and grant requests. 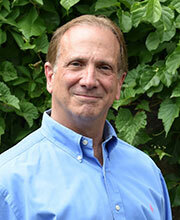 He comes to FCF with many years leading and consulting within the healthcare, non-profit and marketing worlds. He serves on the board of the National Pancreas Foundation, which has already brought synergies with the work of FCF. We wish to thank our retiring Executive Director, Bill Beermann, for all his hard work these past five years. We are pleased and grateful of Bill’s offer to continue on our Board and to assist in handling the finances of the Foundation going forward, on a volunteer basis. 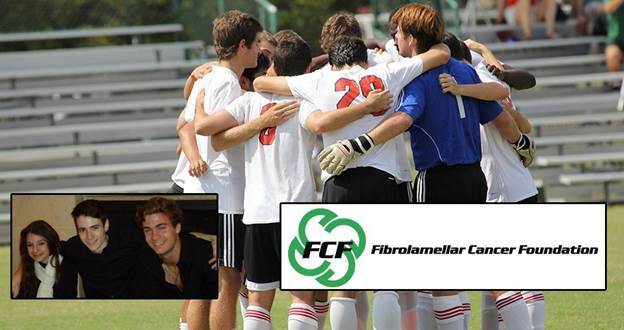 March 25 was the first annual soccer match sponsored by Rhodes College in Memphis, TN to raise money for FCF in honor of Max Burdette (pictured in middle of inset) who lost his battle with fibrolamellar last summer at age 17. Max’s brother Paul is on the soccer team. Approximately $1200 was raised prior to and on the day of the event. That will be supplemented with online donations made directly to the Fibro Foundation. If you would like to donate in honor of Max Burdette, click on the donate button at the top of the page and note on the form that your donation is to honor Max. Pictured above, front center in the Hard Rock t-shirt is Tim Widener, his wife and two daughters next to him. Tim, whose daughter Super Sadie is one of the youngest fibrolamellar patients, organized a massive pro-wrestling event in Fayetteville, NC. The wrestlers, many of whom are superstars, performed before a packed gymnasium. In addition to ticket sales benefiting FCF, Tim organized and ran an auction, photo shoots with the wrestlers and even a concert the night before the matches. Tim was supported by the large contingent of Fibro fighters, their families and FCF Board and committee members pictured above. Click here for additional photos from the event. Also check out the Seek & Destroy and Tim Widener’s facebook pages. Thank you Tim for organizing this major fund raiser and for entertaining the crowd with your own performance! You are an FCF star! Cycle for Survival is a nationwide event to raise money for rare cancer research. 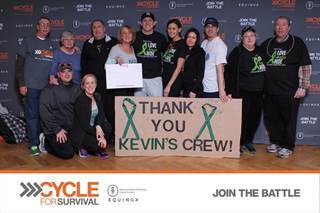 The family of Kevin Casazza, put together two teams for “KEVIN’S CREW”, all proceeds going to fibrolamellar research at Memorial Sloan-Kettering. The first event was held at Equinox in Summit, New Jersey on February 7th. The second event was held on March 7 at the Equinox on the 50th & Broadway in New York City. Thank you Casazza family! FOR A SMALL RARE CANCER FOUNDATION THERE WERE 46 DIFFERENT EVENTS HELD DURING THIS CALENDAR YEAR INCLUDING 30 COFFEE SOCIALS! WHAT AN INCREDIBLE OUTPOURING OF SUPPORT. BELOW IS A BRIEF LISTING OF THE VARIOUS EVENTS AND THE FAMILY/PATIENT BEHIND EACH. FURTHER DETAILS ON SOME CAN BE SEEN IN THE PAST EVENTS SECTION OF THE WEBSITE. Glenn Alexander wrote “Here’s To Jay” in honor of his nephew who died from fibrolamellar at only 20 years old. The song is not only available at CD Baby, but also now on iTunes, Google Play and Amazon. Links to the above sources appear here under Jay’s photo. Many thanks to each organizer of these events. Some brought in big donations, like $20,000; the total for the coffee socials was almost $30,000. Others brought in several hundred. Whichever the dollar amount, the commitment to raise monies for FCF is most appreciated. This event was to commemorate three years since Jay Alexander’s passing. It was held November 13, 2014 at Brick Street Brews in Arkansas. $2,055.80 was raised for the Fibrolamellar Cancer Foundation from the event. Shelia, Greg, and Brooke Alexander were the guest bartenders and they packed the house! 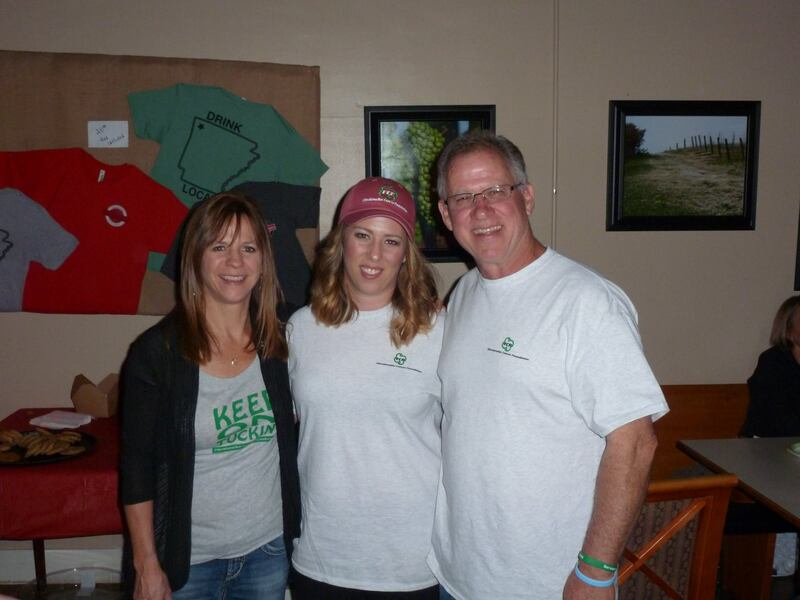 Brick Street Brews serves local craft beers and wines; they donated $1 per drink to FCF. The “bartenders” (pictured to the right) donated all the tips. What a wonderful event! This is only the latest event organized by the Alexander family since Jay’s passing. A “Jumping for Jay” skydiving event happened the year after Jay’s passing, Brooke ran in the NYC marathon, and a friend of the Alexander’s ran multiple marathons raising significant funds for FCF. Thank you Alexanders for all you do for FCF! During the month of October there are coffee socials happening all over the U.S. and even a few on other continents. This is the second year for these coffee socials, hosted by friends of the fibrolamellar community, to raise awareness and money for FCF. Last year there were approximately 25 events taking varying forms from simple in-home morning coffees to more elaborate events. Approximately $28,000 was raised. This year the events have taken on some really interesting forms. One coffee social in Illinois was actually a wine glass painting party, another included a raffle at Drew University, and the ladies of AST at Radford University in Virginia had a weeklong coffee social during lunch hours. During the month there will be a dessert auction, pumpkin carving event, and dinner with entertainment by Josh Panda who wrote the song for FCF featured on the official video. 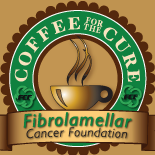 October is Fibrolamellar Coffee Month was started by Gail Trecosta, mother of Matthew 1999-2014. Gail is a source of strength to many in the fibrolmellar community and constantly supports the Foundation with her time and ideas. 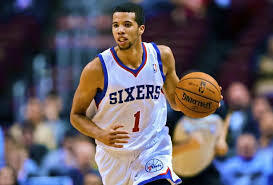 Michael Carter-Williams of the Philadelphia 76ers is the recipient of the Eddie Gottlieb Trophy as the 2013-14 Kia NBA Rookie of the Year. As part of its support of the Rookie of the Year Award Kia Motors America will donate an all-new 2015 Kia Sorento LX CUV to the Fibrolamellar Cancer Foundation. Mr. Carter-Williams designated FCF as the recipient of this donation. FCF congratulates Mr. Carter-Williams on winning Rookie of the Year and is honored to be the recipient of this generous gift. 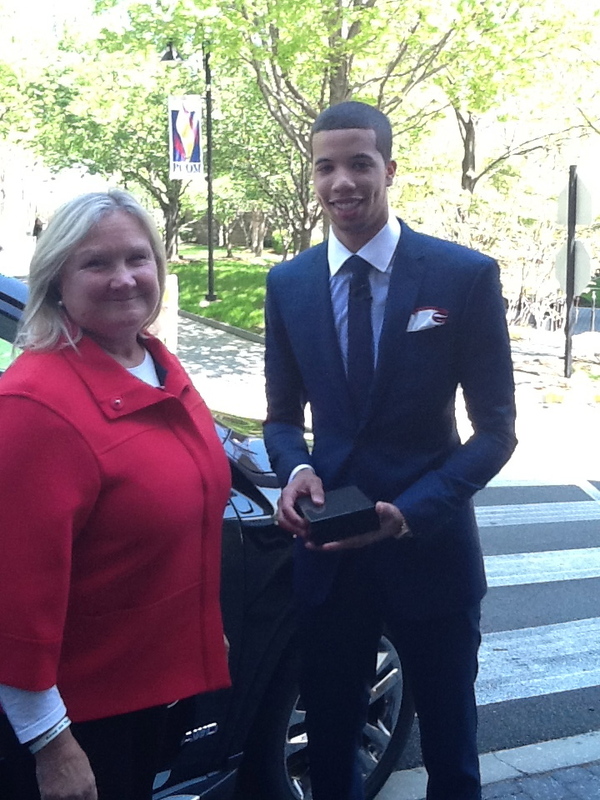 Photos: Michael Carter Williams playing for the 76ers and with Marna Davis, President and Board Chair of FCF. Below is a reprint from the Wall Street Journal, February 28, 2014, written by Ron Winslow. When Elana Simon was 12 years old, she was diagnosed with a rare form of cancer that required an operation to remove much of her liver. Now 18, Ms. Simon, a high school senior, dancer and aerial acrobat, is deemed cancer-free. She also is a key member of a research team that has identified a genetic abnormality that may be a cause of the mysterious cancer, which afflicts about 200 adolescents and young adults a year world-wide. Ms. Simon initiated the study and worked closely with scientists at Rockefeller University, where her father runs a laboratory, as well as at Memorial Sloan-Kettering Cancer Center and New York Genome Center, all in New York, to conduct genetic sequencing and other analyses. The disease, called fibrolamellar hepatocellular carcinoma, has no effective drug treatments, and without surgery, prognosis for patients is poor. The genetic anomaly Ms. Simon and her colleagues found is a fusion of parts of two different genes. It turned up in tumor tissue taken from all 15 patients they studied, while it wasn’t present in any normal liver tissue removed from the same patients—a strong signal that the mutant gene could be a culprit, researchers said. Finding such a mutation doesn’t mean it definitely causes the cancer and more research needs to be done to establish its role, said Michael La Quaglia, chief of pediatric surgery at Memorial Sloan-Kettering and a co-author of the study. But assuming a clear link is determined, the findings could lead to a diagnostic test and perhaps a treatment. Beyond showcasing the ingenuity and determination of a teenager eager to learn about her own disease, the research underscores the growing impact genome sequencing and other technologies are having on rare diseases and cancer. 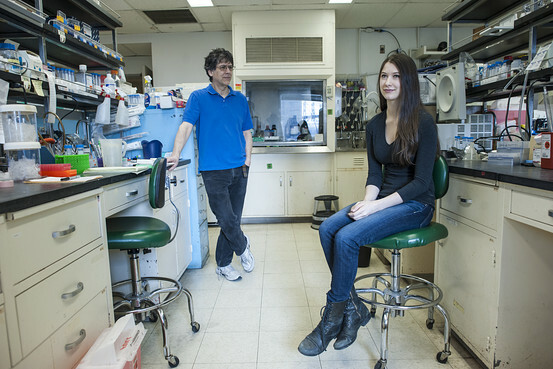 These analytical tools are part of a “perfect storm” that make science more accessible, even to young people like Ms. Simon, said her father, Sanford Simon, who heads a biophysics laboratory at Rockefeller where much of the work on the new study was done. Ms. Simon, who had suffered stomach cramps as a child, was diagnosed with lactose intolerance, stress, appendicitis and a possible bacterial infection before doctors determined the source of her symptoms was liver cancer. Ms. Simon went to the Internet to learn what she could about this disease. When she turned 16, she landed an internship at a lab at Mount Sinai School of Medicine in New York through a science program at the Dalton School, a private school in Manhattan where she is a student. “I wanted to go off and be my own scientist,” she said of the idea, which she pursued without consulting her father. Her project: to compare genetic data sequenced from tissue from eight pancreatic cancer patients to hunt for mutations that might separate cancerous samples from normal ones. But the tissue was from older patients who through normal aging had accumulated thousands of harmless mutations that made spotting one or two potentially meaningful ones difficult. For Ms. Simon, a light went on. Younger people have far fewer potentially confounding mutations. Maybe performing a similar study on tissue from young fibrolamellar patients would yield the genetic secrets of the disease. She proposed the idea Dr. La Quaglia, who was also her surgeon. He led the effort to collect tumor samples from fibrolamellar patients he operated on and assigned research fellows from his lab at Sloan-Kettering to work with Ms. Simon and Dr. Simon and other researchers at Rockefeller. The effort was supported by a grant from the Fibrolamellar Cancer Foundation of Greenwich, Conn., established by the parents of Tucker Lowe Davis, who died of the disease in 2010. What began to emerge from the sequencing data was what researchers call a deletion, a spot where a significant segment was missing on the strand of DNA. The strand was joined by the fusion of two different genes. When it became clear that the fusion was showing up in all of the tumor samples, other scientists in Dr. Simon’s lab pitched in to help confirm the function of the aberrant genes. Joshua Honeyman, a fellow from Dr. La Quaglia’s lab, was co-first author with Ms. Simon on the study. Ms. Simon is currently at work on a second paper about the research. She plans to attend Harvard University in the fall, with a major in computer science. FCF has had runners in the New York City Marathon raising money for FHC research since 2009. For the first two years we had two runners each year; in 2011 the FCF team was 7 runners. 2012 and 2013 recorded 15 runners! The 2009 runners were Hilary Boardman and Marc Centrella. In 2010 our runners were Courtney Guyette and Terriane Bowen. 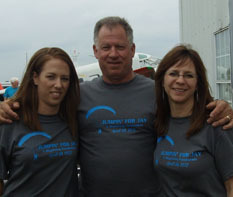 The FCF team of 7 in 2011 ran with Fred’s Team from Memorial Sloan-Kettering (MSK). 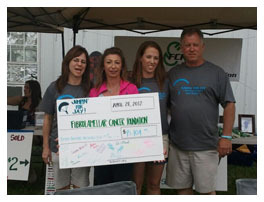 All funds raised by FCF runners, over $36,000 went directly to the Fibrolamellar Research Fund at MSK. The 2011 FCF runners were: Nel Andrews, Yasmin Barrie, Kurt Bolin, Ken Ciccarelli, Ronald English, Jay Niedzielski, Lora Tirri. The 2012 FCF team, which was again part of the MSK Fred’s Team, was 15 strong, even though they did not get to run due to the cancellation of the marathon! Many did however run in 2013. They raised over $80,000 to support FCF. These 2012 and 2013 Winged Foot Ambassadors were: Brooke Alexander, Charles Beermann, Kurt Bolin, Terrianne Bowen, Hayley Davis, Whitney Davis, Abdi Dubed, Ronald English, Sierra Fromberg, Johann Jaremczuk, Bo Keatley, Somya Munjal, Elizabeth Nolan, Nancy Westbrook, and Kathryn Wiseman. Gail, you are amazing! Thank you… the coffees raised over $20,000 for FCF. 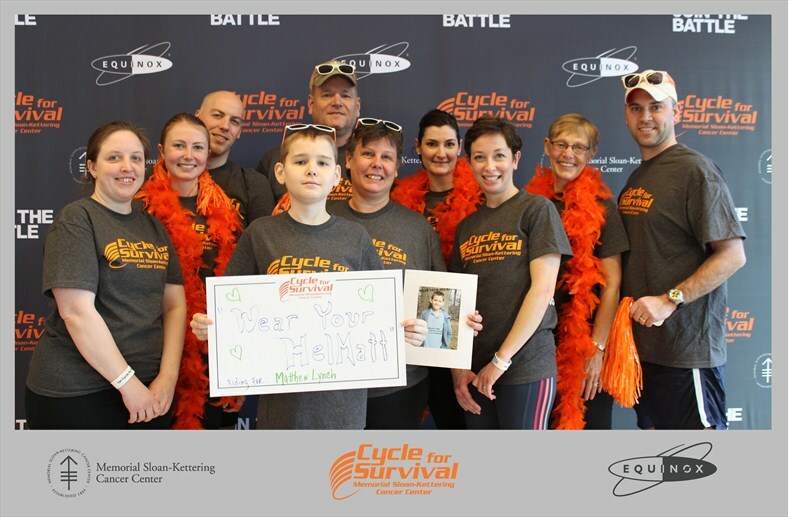 Team “Wear Your HelMatt” rode for fibrolamellar patient Matthew, age 14, on Feb 10, 2013 at the Cycle for Survival event in Bethesda, Maryland. Nine team members raised donations from 84 individuals and families, totaling more than $6,000 for Memorial Sloan-Kettering Cancer Center’s fight against FHC. Jay Alexander passed away on November 4, 2011, at age 20, only 32 days after a tumor was found and diagnosed as Fibrolamellar Hepatocellular Carcinoma. The Alexander family immediately decided to honor one of Jay wishes. 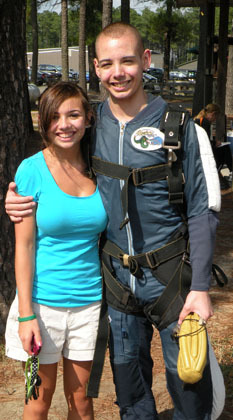 Jay had always wanted to sky dive and was planning to do so on his 21st birthday. That never happened so his family jumped in his honor and then several months later organized a major skydiving fundraiser for FCF – Jumpin’ for Jay. They raised over $17,000. Below are two photos from the event, one of the Alexander family with FCF’s Lynn O’Malley holding the sign, and the second of the family wearing Jumpin’ for Jay t-shirts. Fundraising in Jay’s honor will continue this fall; Jay’s sister Brooke is running in the NYC marathon as part of the FCF group. We are so thankful to the Alexander family. Zach Grullon was diagnosed with Fibrolamellar Hepatocellular Carcinoma in March 2010 and passed away on January 28, 2012 at 20 years old. Zach had the opportunity to sky dive with Greg Windmiller of the United States Army Golden Knights Parachute Team in 2010. In honor of Zach, The Grullon family decided to host the 1st annual three-event fundraiser on Saturday, June 2, 2012 in Fayeteville, North Carolina. The Free Fall to Fight Cancer event attracted 60 skydivers to jump tandem with over 20 volunteers from the U.S. Golden Knights and the Raeford Parachute Center. The Ride To Fight Cancer drew motorcycle riders to participate in a 50 mile ride ending at the Raeford Parachute Center. The Cruise To Fight Cancer consisted of many fancy cars also ending their ride at the Raeford Parachute Center. There were over 200 people on hand throughout the day to enjoy the Golden Knight Parachute Team demonstration, entertainment, food, raffles, silent auction, face painting, games and water rides. All three events raised over $15,000 which has been donated to the Fibrolamellar Cancer Foundation. Below are photos: first is Greg Windmiller and The U.S. Army Golden Knights; then, left to right, Zach and his sister Breana after his jump in 2010, and; Kevin & Shawn Grullon, Zach’s dad and step mother, . Many thanks to the Grullon family for all their hard work and support! We look forward to the 2nd Annual Free Fall to Fight Cancer event in June 2013 !